This post is about a site named jailbreak.me that allows you to jailbreak your iPhone doing nothing more than just visiting. But don’t misunderstand, we don’t encourage you to jailbreak your iPhone or any other device, we just inform you about how to secure your iPhone from worms and different viruses, so if you choose to jailbreak your device is just your own risk. With all of this being said, let’s unveil what really matters for you and your iPhone’s safety. F-Secure informs us about the two vulnerabilities of this site ‘First one uses a corrupted font embedded in a PDF file to execute code and the second one uses a vulnerability in the kernel to escalate the code execution to unsandboxed root’ and it seems that Apple was never informed of this. And it’s not just an iPhone problem because it also affects iPad and iPod Touch, no matter which version. Some vulnerable applications are Foxit Reader and FreeType2. Apple is expected to ship very soon a patch that will solve this problem. So, what’s the risk ? F-Secure assures us there’s no risk of an iPhone warm at this moment but is dangerous and it may hit us within a week or so. What can you to be safe? 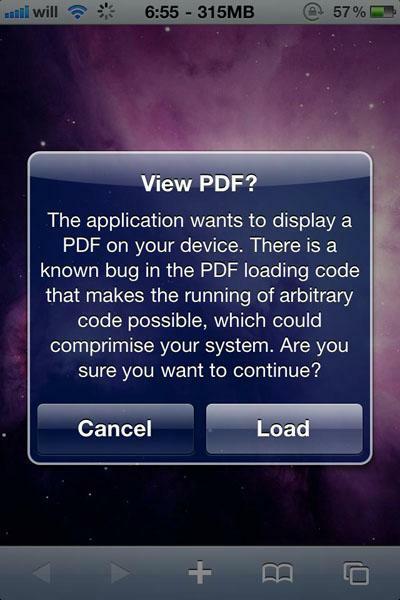 Well, F-secure got an answer for that too: ‘If your iPhone is jailbroken, you could consider installing the “PDF Loading Warner” app, made by Chronic Dev Team. We’re not endorsing the tool, but it might help.’ The purpose of this tool is to prevent you every time a web page tries to load a PDF file, even if it’s harmful or not. Now, i will finish this post with a conclusion because it’s a little confusing what’s going on. Well, first of all, all iOS devices are affected, and if you choose to jailbreak your iPhone (and expose it to other risks) install the PDF Warner. We hope Apple will hurry up with that patch, and as soon as we find more about this subject we will inform you.